Originally the plan at The Bent Brick was to be bar with fancy little noshes, and quite ambitiously to feature only domestic alcohol (I forgot all about this until Glenda tried to order a Scotch. Luckily summer is here, so she easily switched to a locally grown Aviation Gin and Tonic). Because of this, The Bent Brick has no bottles of wine to order, but if you bring in your own empty, or pay $1 for their empty bottle, they will fill up a bottle with a locally produced wine for you to take home or if you want to drink it on the premises it comes in a carafe thingee. I’m sure this policy of no non-regional liquor irritates many people who think they are coming into a normal bar, but we have so many great wineries, brewers, and distilleries now, it seems like a really noble concept to me, although probably much work for The Bent Brick liquor purveyor. The Bent Brick has now been open two years, and the first time I went there was about 4 months after they opened, in late October when the space has a much different feel than on an almost summer evening (but both times the ambiance was good, if totally different). Since I do love the building so much, and Park Kitchen is an interesting (if expensive) eatery, I was anxious to visit The Bent Brick not too long after I heard they had opened, so a friend and I dropped in there for dessert and a drink after having a full meal elsewhere (oh, but where?) Back then the food was the original concept, Modernist (think foam and strange ingredients) and the specialty drinks were rather strange, and although I loved being inside the building, and thought what they had done with the space was good, I wasn’t thrilled with either my cocktail or my dessert (I remember butterscotch something and Cheerios). So it was a mixed bag. Also, it seemed mainly like a trendy bar with fancy food bites, but if you are in a weird neighborhood like Stumptown, you might not end up getting the young, beautiful bar hopping masses you desire to keep your enterprise thriving. Anyway, it sounds like this was perhaps the case, that The Bent Brick was not getting the eating and drinking clientele they desired, so Mr. Dolich ended his relationship with his well thought of but way too fancy and experimental chef, and reinvented his bar as more of a food slinging tavern with a more homey menu centered around items like hunks of meat, house-made sausages, and interesting salads. These days, they even have a kid’s menu. Eegads! And they serve Jo-Jos (okay, they are duck fat Jo-Jos). Does it surprise anyone to know that Glenda had to ask what a Jo-Jo was). This was not my most successful outing, crowd-wise (four of us) but we were four minds mentally in sync, so what could be better than that? As previously alluded to, the Jo-Jo deficient Glenda was there, and the always pleasant and fun Tracy and Peter (in very tight jeans) joined us as well. Since it was a lovely evening, all doors and windows of The Bent Brick were thrown open, and we all marveled at the wonderful atmosphere this space has in the summer, the cozy brick with the natural light pouring in from outside. As is typical anyplace in Portland with a patio, when the sun is out, and the temperatures are warm, more bodies tend to congregate outside than indoors, despite the groovy surroundings. As touched on before, the domestic only bar program at The Bent Brink can make drink ordering a bit more strenuous than usual, so Peter and Tracy had a bottle of red wine filled up for their pleasure, and Glenda had that G & T once her request for a nice Scotch was shot down. Drinks are getting so expensive these days, and most of the dinner items I had in mind weren’t cheap either, so I hoped to not spend too much on liquid refreshment. Finally I settled on trying out TBB’s offer of one of their house made sodas with either gin or vodka for $7, deciding on vodka with pomegranate soda. It reminded me much of what would happen if I decided to whip up a cocktail at home after scrounging for materials, not too exciting. No wonder bartenders develop actual drinks. The Bent Brick is another of those places where to get bread you have to order it and pay for it, but Glenda only eats bread about half the time, Peter has been on a low carb diet for several months, and Tracy didn’t mention bread, so I was doing fine without even contemplating bread this evening. Besides, TBB’s bread, instead of coming with butter or olive oil, comes with a side of lardo, which sounds just plain gross to me. Sure, give me a rib eye with some nice marbling or some potatoes cooked in some naughty oil (details to come) but I don’t want to belly up to a plate of fat, especially as I don’t want to up my belly, intentionally. As this was more like a dinner between friends than a group dinner, we really didn’t do much sharing this evening, with the exception of my fat fried potatoes. So consequently, I can only mention what we ordered, and add comments, if I heard any. Fried Pickle Plate – Our friend Peter, he appears to be a pickle fanatic. Perhaps it’s that Swedish upbringing. I guess if you like pickled herring, a lot of other pickle products might be right up your alley as well. 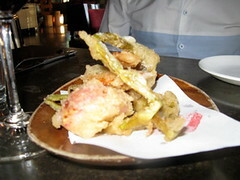 Here the pickle plate was like pickled tempura (when’s the last time you saw that?) and even included a pickled egg (what times we live in, not only magenta colored pickled eggs, but magenta colored pickled eggs coated in tempura batter and deep fried.) 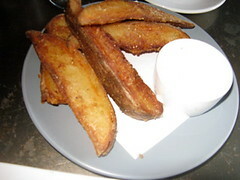 Although tempura tends to be light and airy, I don’t think there’s any way to make a pickled, boiled egg light and airy. It’s kind of like a tempura Superball. 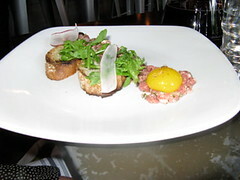 Steak Tartare with coriander capers, arugula, farm egg, bread – given the choice of really rare, barely cooked beef or raw beef, I always choose the rare beef, I think modestly cooking beef gives it a little extra flavor, and some body. 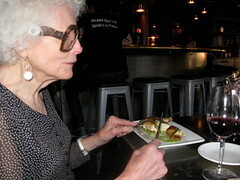 Glenda seems to always jump at the chance to have raw beef though, and loved this particular tartare plate. Spring Onion Soup with chopped bacon, eggs and toast – It was a warm day, so I didn’t think soup was that appropriate, but I love a nice creamy onion soup, so decided I would go for a cup anyway. The waitress mentioned that it was a chilled soup, so that seemed to seal the deal. 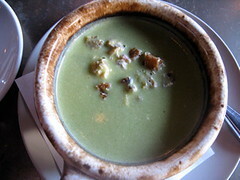 When it arrived, it was actually a hot soup, which wasn’t really an issue, as I don’t like cold soups overly well anyway. It was good, however, looking like pea soup but tasting of mild onions. Asparagus Salad with almonds, buckwheat, shaved hard cheese – Nothing like good eyesight! Originally I was going to order this salad, based on the menu online. I deluded myself that there was adequate natural light filtering from outside, so I didn’t need to put on my eyeball improvers, I believed I could see just fine. My final reason for not ordering this item? I thought the menu listed shaved “head” cheese. Now that’s just plain gross, who wants that in their salad? Now I see it was shaved hard cheese. Rats, I actually would have liked that (me and rats). Glenda had this salad, and remarked that everything at The Bent Brick was wonderful (and without even tasting a Jo-Jo). 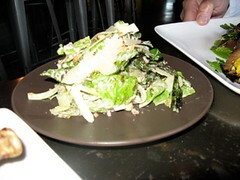 Oyster Mushroom Salad with celery and crispy wild rice – As The Bent Brick had several tasty sounding salads, (none including head cheese) Tracy asked the waitress for a recommendation. Tracy’s opinion, excellent. Grilled New York Steak with spring onions, blue cheese butter – Good, about the third best restaurant steak I’ve had in the last year. 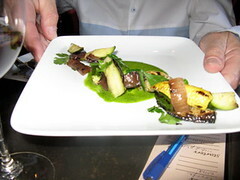 Number one and two were Ox and Tasty N’ Alder, but those were both nicely charred rib eyes. Tracy thought this was really good as well. 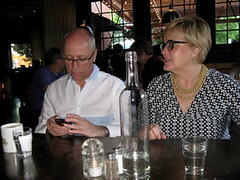 We have not actually seen too much of Tracy and Peter over the last year, but they always seem to come out when there is good steak to be had (they were also at Ox and Tasty N’ Alder). 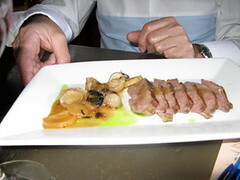 Duck Breast with maple glazed parsnip – Peter was quite pleased. Poached Chicken Breast with tarragon mustard – As mentioned before, Glenda loved everything, including this. Me being me, naturally I could have forced myself to have dessert. 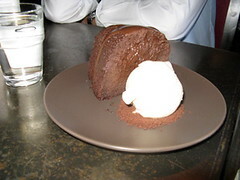 I didn’t want to put out additional money, however, and since I had splurged for a “cocktail” and the dessert selection was small and lacking anything I could not absolutely live without, I forced myself to pass. I was given a utensil though, and when I didn’t order dessert Tracy mentioned something about sharing (Chocolate Pudding Cake) but then there appeared to be dessert hoarding going on, so I have no idea if the desserts were good or not (to be fair, Tracy and Peter were already sharing with one another, and I don’t like Rhubarb anyway, in the case of the other dessert. Rhubarb Crisp.) The plates were empty at the end of the meal, however, so neither of the sweet items must have been overly revolting. Our fabulous group of four had a really satisfying meal at The Bent Brick. Tracy and Peter both commented on how glad they were that we had a dinner at this venue, even if we were diminutive bunch for group dining Were I to rate the Bent Brick on one of those boring number scales, I would do it as such: Service – 8: Food Quality – 7.5 – 8; Interesting Menu – 8, Atmosphere – 9. As far as the food quality ranking goes, 7.5 – 8 is really very good. 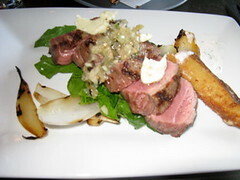 I liked the things I ate, and so did the others, most things could be described as delicious. Were they exceptionally delicious though? No. I save the exceptionally delicious category for some of those really wonderful places we have eaten, restaurants like Ox or Tasty N’ Alder. Those kinds of places have elevated food and exceptionally interesting menus. The Bent Brick is for drinking in the atmosphere on a lovely warm day and having some well prepared food, either snacks or more substantial plates. Like Tasty N’ Alder, because of some cheaper items like sausages, the pricing runs the gambit. Food is the main priority at Ox and Tasty N’ Alder, but here it doesn’t have to be, it’s a tavern, you can just have a drink if you like. Certainly no one is going to stand in line 2 hours at TNA or Ox to just have a drink and maybe a light snack., you need to get the most for your effort. Here things are more casual, spend a little, spend a lot, drink and dash, or dine for hours, it all works well at The Bent Brick. And don’t forget, they have Jo-Jos too, whatever those are.